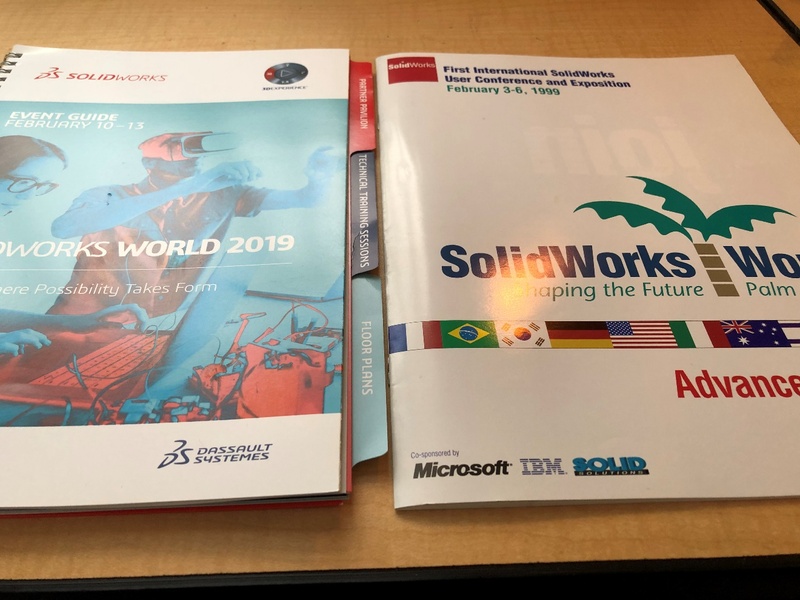 On the flight back home from Dallas after SOLIDWORKS World 2019 I reminisced about attending my first World in 1999 as a new SOLIDWORKS employee. Attending World was a completely new experience for me and I didn’t realize at the time what an event it would become. I don’t remember how many people attended in 1999, but it was nowhere near the 6,000+ we saw at this year’s event. Back then World was split into two events; the first half was for employees and our Value-Added Resellers (VARs) and the second half for customers. 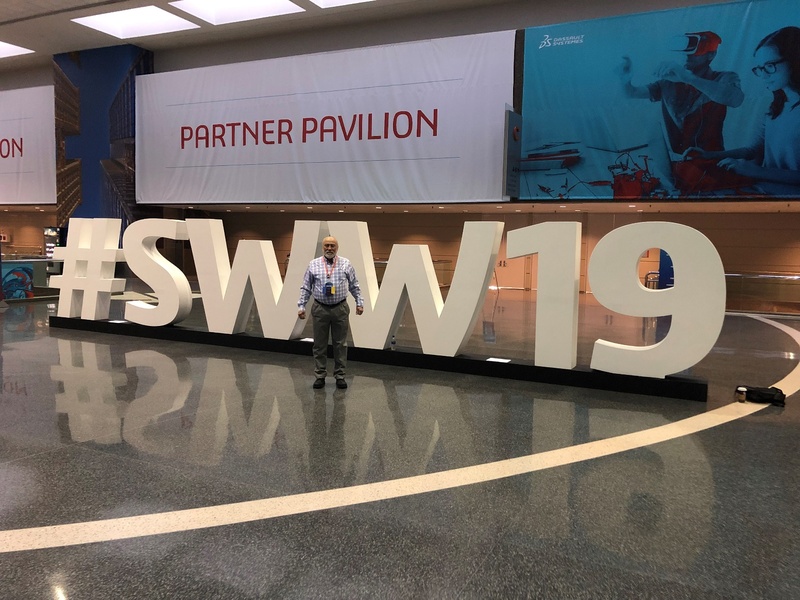 For most of us employees we didn’t get a chance to mingle with customers during the early SOLIDWORKS Worlds. That all changed some years later when it became a combined event for everyone to attend at the same time. 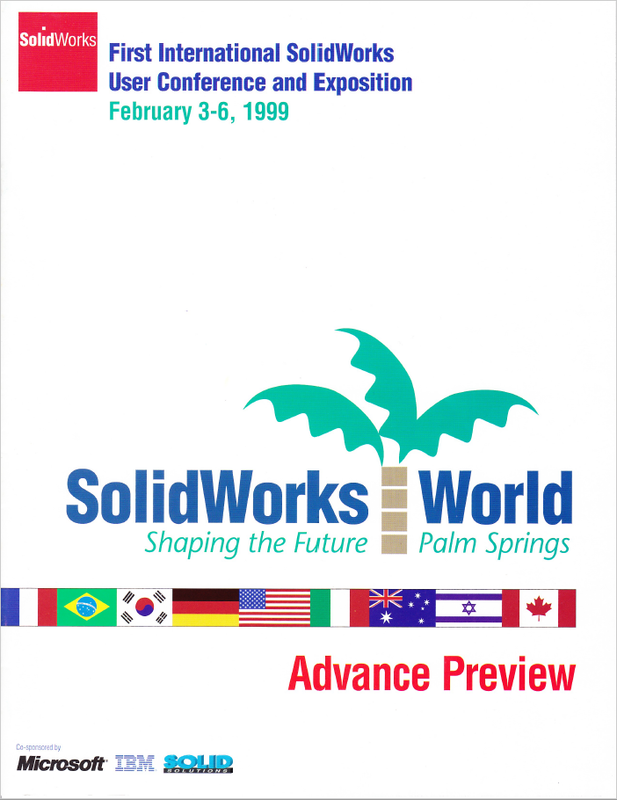 When I got back home I looked through my archives (a bunch of boxes in the basement) and I found some interesting memorabilia from the first SOLIDWORKS World. I found the shirt the employees were given. I guess I was a little thinner back then as this shirt is a large and I usually take an XL these days. 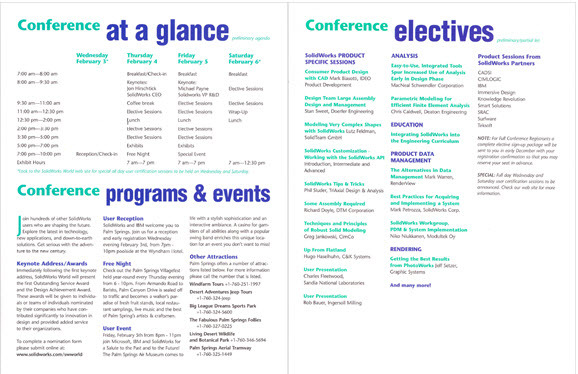 Next thing I found was the Conference Event Guide, a whopping 8 pages! Compared to the event guide from World 2019, the 1999 event guide pales in comparison. The customer breakout sessions were quite interesting. Back in 1999 Large Assembly Management was an important topic presented by customer Dan Sweet, Phil Sluder presented his first-ever breakout session at World, Graphics Systems Applications Engineer Jeff Setzer showed off PhotoWorks, and future SOLIDWORKS employees Mark Biasotti, Lutz Feldman, and Richard Doyle presented. Another treasure I have from SOLIDWORKS World 1999 is the employee shirt. 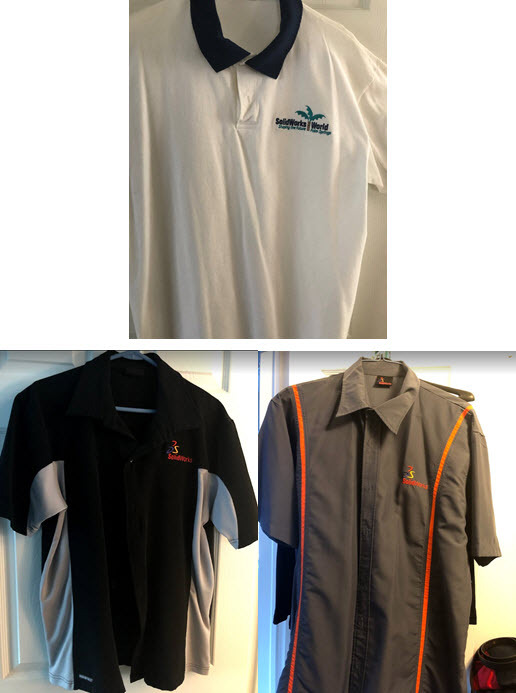 In fact I might have all of the SOLIDWORKS World employee shirts along with most of the backpacks and tee shirts. Some of the employee shirts are nice but some were so-so. The least popular are what we called the “bowling” shirts. Next year the 3DEXPERIENCE World will be unveiled and SOLIDWORKS World will be no more. At least I have a lot of memories to remind me of the 21 SOLIDWORKS Worlds I attended. From New Orleans and the Bourbon Street pub crawls and working on a Habitat for Humanity house after hurricane Katrina, to Disney World and Main Street USA and Universal Studios amusement park, to Las Vegas and racings cars at Las Vegas Motor Speedway, to San Diego and the Gas Light District, which was probably my favorite World. These were all great and I’m glad to have experienced them all!